The importance of the under-ice habitat for Antarctic krill was probably under-estimated in the past and emphasise the susceptibility of this ecological key species to changes in the sea ice habitat induced by climate warming. This was the main conclusion of Antarctic research of IMARES, part of Wageningen UR, published on 23rd February 2012 in the online journal PLoS ONE. It summarises five years of IMARES research in the Antarctic Ocean with a newly developed under-ice net: The association of Antarctic krill Euphausia superba with the under-ice habitat. 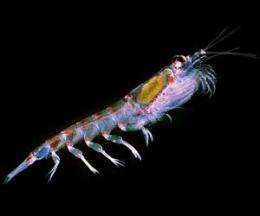 The shrimp-like Antarctic krill is an ecological key species in the Antarctic ecosystem, and an increasingly targeted fisheries resource. Sea ice constitutes an important foraging ground for Antarctic krill, because it can harbor substantial amounts of algae and other micro-organism in its structure. The underside of the ice where krill graze, however, has so far been difficult to access for scientific sampling. By using Surface and Under-Ice Trawls (SUIT), IMARES researchers and their international partners attempted to overcome such constraints during three expeditions in the ice-covered Antarctic Ocean. Their study presents the first geographically wide-ranging evidence of the distribution of Antarctic krill directly under sea ice. The results indicate that Antarctic krill are attracted to the ice-underside both during summer and winter. Comparison with results acquired with deeper fishing nets commonly used for biomass assessments indicated that a large proportion of the krill population resided directly under the ice, where it was out of reach of these nets. More information: The association of Antarctic krill Euphausia superba with the under-ice habitat. Flores, H., et al. 2012. PLoS ONE 7(2): e31775.